Today, I’m sharing an amazing quiche with y’all. It’s made using ingredients from these generous #brunchweek sponsors – Cabot Creamery Coop and Michigan Asparagus. 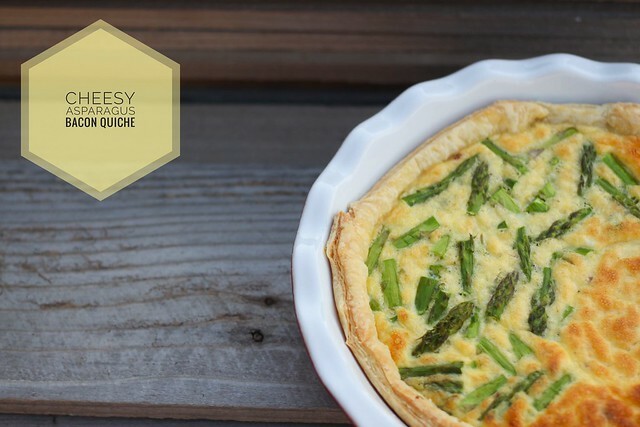 This quiche is not only delicious, but with the addition of the asparagus, this quiche also makes for a nice presentation. For the crust, I used puff pastry dough, which takes away the prep of having to make your own crust. Then, the mixing of the ingredients is a cinch, too. No one has to know that this quiche is easy to make – they will be so impressed by the flavors in this quiche! I mean….cheese, asparagus, bacon? You can’t go wrong here! Preheat your oven to 350 degrees F. Roll out your puff pastry dough to be approximately 12×12″ in size. Grease the inside of a deep pie dish well. Place your puff pastry dough into the pie dish, and gently manipulate the dough to line the inside of the pie dish. Trim the puff pastry to the top edge of the pie dish. You can either discard the trimmed pieces or just bake the leftovers to enjoy at another time. Remove/discard the tough ends of the artichoke, and chop the stalks into 1/2 inch pieces. Place the eggs, asparagus chopped bacon, grated cheese, whipping cream, and salt/pepper in a medium sized bowl. Beat the mixture until everything is well-combined. Gently pour the egg mixture into the puff pastry-lined pie dish. Evenly sprinkle the asparagus pieces over the egg mixture. Bake the quiche for 25-30 minutes, until the quiche starts to lightly brown at the top and the eggs are cooked (the quiche shouldn’t jiggle once it’s done cooking). Allow the quiche to cool until it’s warm enough to eat. Enjoy! Great minds Amy….your quiche looks wonderful.